Preschool children look up whenever they hear an airplane. They are fascinated by the sound and the sight of a shiny, big object moving in the sky. Use this interest to spark learning and take airplane ideas across the curriculum. What flies in the sky? (birds, airplanes, helicopters, hot air balloons, etc.) See how many objects the children can brainstorm. Have you been on an airplane? Where did you go? Show pictures of airplanes and other flying machines to the children while asking these questions. Match airplanes by color on a flannel board. Cut two airplanes from each color of felt you have. Place one of each color on the flannel board. Ask the children to pick up a felt airplane from the ground, and match it next to the one you already have on the flannel board. Use this learning experience to not only match colors but to count airplanes as well. Purchase a bag of plastic airplanes (from a toy or dollar store) to use for counting, sorting, and matching. For a learning game, give the children a toy airplane, and tell them to follow your directions. Use spatial commands, and have the children stand near the airplane, beside the airplane, under the airplane (hold it above the head), in front of the airplane, or behind the airplane. Use shoeboxes to make airplane hangers for these planes. Collect and use six boxes. Number them from 1 to 6. You can increase the number of boxes and counting opportunities if you wish. Using the toy airplanes, invite the children to park the correct number of planes in each hanger. Teach the children to sing this song while "flying" their airplanes. The tune is "I'm a Little Teapot." Here is my throttle, give me a try. Off the runway and up to the sky. Try the following fingerplay with your preschool group. Another fun music and movement game is "musical airplanes". Tell the children to pretend to be airplanes flying around the sky (room). Play some music to accompany their flying. Every time you stop the music, the children must stop flying. Start the music and they fly away again. Give the children two wooden craft sticks (tongue depressors work best). Let them paint these sticks any color they choose. When the paint is dry, glue the sticks together, one on top of the other, to make an airplane. 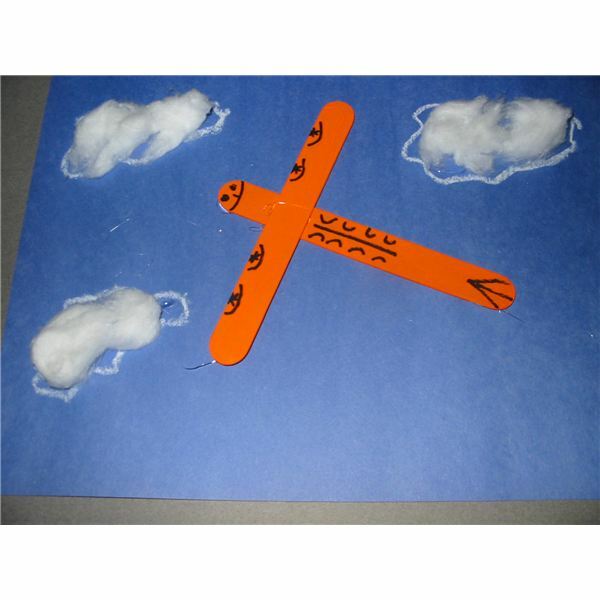 Next, glue the wooden airplanes onto a sheet of heavy blue construction paper. Draw outlines of clouds, and fill these in with white cotton balls that can be glued on. As a variation, these wooden airplanes can be tied with string and hung from the ceiling. For additional ideas, read Kindergarten Transportation Unit, Part 1: Airplanes and Helicopters right here on Bright Hub Education.